The response to the Helsinki meeting has been so extreme on all sides that questions about the maturity, stability, and intelligence of the entire American political community are incited and require some act of faith to deal with positively. Earlier U.S. presidents created shock waves as great as these but managed them better. The Trump phenomenon and his assault on the political establishment were bound to cause immense convulsions. In the terrible economic crisis of the 1930s, Franklin D. Roosevelt swept out the stable and, while he riled many, his suave and mellifluous patrician manner and demiurgic political dexterity kept the country on an even political keel out of the Great Depression and through World War II. The Northeastern establishment that John F. Kennedy led to Vietnam and that induced Lyndon Johnson to plunge into that conflict, followed by the Watergate debacle, the abandonment of Indochina to the Communists, and the over-conscientious irresolution of the Carter presidency, left Washington an open city for Ronald Reagan and his optimistic Californians, like George Shultz and Caspar Weinberger. Again, the president's almost hypnotic talents as a public speaker and his immense personal and public charm, assured that profound changes could be assimilated without excessive strain on the country's political fabric. Donald Trump promises and is delivering as much of a change as Roosevelt and Reagan to a political system at least as decrepit and more corrupt than those earlier presidents inherited, but he does not have a remotely emollient public personality and and takes no trouble to reduce his vulnerability enemies. His task would be easier and his followers less skittish if he prepared for serious occasions, had some respect for detailed facts, didn't treat world leaders like a gallery of Trump country corn-cobbers, and did not, though he is obviously a very able man, give the impression that he thinks he is much more intelligent than he is. There will long be debate about which side, Trump or his enemies, is chiefly responsible for this worrisome and unseemly escalation where his enemies want to remove him from office for undiscovered crimes before he is able to have them prosecuted and imprisoned for crimes of which there is, unfortunately, a good deal of indisputable evidence. Trump's enemies could not resist the temptation to try to undo the election; he would have let bygones be bygones, but he is not one to turn the other cheek when attacked. Now they must remove him, or he will try to imprison them, and in fact, they have almost no chance of removing him. We are doomed to a fierce battle that will end quickly if the Republicans hold the House of Representatives and Trump can get rid of Sessions and Rosenstein and indict his enemies, who have certainly asked for it. Or it could be dragged on for another six months if a frivolous impeachment case is mounted. We learned from the absurd impeachment of President Clinton that the effect on the target is like a revivifying enema, and he bounces back quickly. Now the process is inexorable. The desperation of Trump's enemies explodes at every opportunity. 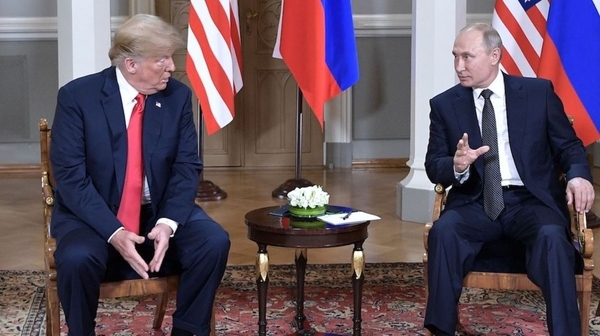 Nothing particularly objectionable occurred at Helsinki. Putin's version of the Russian role in the 2016 U.S. election, though untrue, (like most of what Russian leaders have said since Peter the Great), is closer to the truth than the criminal and demented skullduggery of the Obama agency chiefs and the Clinton campaign claque. Trump was artless and so cavalier at the joint press conference that he rattled the nerves even of his own followers. But most of his Washington followers are weak-kneed late-comers anyway. They are easily confused by the technique of the wizened Democratic leaders and their media stooges of magnifying the danger of the national basket case of Russia, and conflating the puny, ineffectual Russian 2016 election interference with the phantom canard of Trump-Russian collusion. Until the inert Sessions-Rosenstein cork can be removed from the legal channel, Mueller will go on with the tedious charade of putting Paul Manafort on bread and water and extracting another twelve names every few months from the Moscow telephone directory and accusing them of improprieties in the United States, (a country they have no intention to visit at his invitation). Regrettably, it has all reached such a pass that there will be little of acceptable taste or sobriety as we proceed to the last phase. Brennan and Clapper will become ever more stupid and contemptible, a high misbehavioral hurdle. Trump's intelligent conservative enemies among the commentators are now down to mere bile, like seasick passengers who have vomited out everything else. The inevitable Carl Bernstein, who a few months ago was announcing a constitutional crisis because Trump's mental incompetence required the application of the 25th Amendment, is this week proclaiming the new constitutional crisis provoked by the president's treason. This may all be another manifestation of the president's undoubted singular genius at provoking his enemies to uncontrollable outbursts of psychotic foolishness. There are the usual comparisons with a kaleidoscope of horrible miscreants from Jim Jones to the ever-popular Adolf Hitler. But it was all unwise, unnecessary, and debilitating. The president should be mindful that it is stressful to be a Trump supporter for those who frequent intelligent people. Even his supporters have been infected with a form of Trump derangement. On Tuesday night, Tucker Carlson dragged from the catacombs of the Cold War left, the ancient Soviet fellow traveler Stephen Cohen, "who writes for the Nation." (He is married to the co-owner and editor-publisher; surely no one else would publish him.) He opened a preposterous discussion about going to war over Montenegro. The NATO Clause 5 that "An attack upon one is an attack upon all" is followed by the provision that each member will determine how best to respond to that attack. NATO needs reform, but not over that point. Sean Hannity brought in Mark Levin, who rightly criticized previous occasions when presidents really had bungled their meetings with Russian leaders, such as Kennedy's calamitous encounter with Nikita Khrushchev in Vienna in 1961. But he also trotted out that malignant bugbear of the unholy coalition of Republican McCarthyites, the old British Colonel Blimp imperialists, the Cold War neutralists like Willy Brandt and Pierre Trudeau, and the Gaullist poseurs as the real defenders of Europe: that Roosevelt had given away Eastern Europe at Yalta. This is a monstrous falsehood, much agreed upon by unrigorous commentators. The Yalta Declarations on Poland and Liberated Europe pledged free and democratic elections in independent liberated countries. Stalin's violation of that pledge brought on the Cold War and was, with the German attacks on American merchant ships in 1917 and the Japanese attack on Pearl Harbor, the greatest strategic blunder in the world in the last 200 years. President Eisenhower opened the first post-war summit meeting, at Geneva in 1955, by demanding that the USSR honor its Yalta commitments. Roosevelt was the chief author of the policy that gave or gave back to the Anglo-Americans-France, Italy, Germany, and Japan, which became flourishing democratic allies, while Stalin, who took 95 percent of the casualties and 99 percent of the physical damage among the Big Three in subduing Nazi Germany, was confined to temporary occupation of strategically mediocre assets in Eastern Europe he was pledged to evacuate. Roosevelt also put in place the architects of the winning Cold War strategy of containment: Truman, Marshall, Acheson, Eisenhower, MacArthur, Kennan, Bohlen, and others. It is admirable to defend President Trump from wrongful attack and to denounce his enemies in the terms they deserve. But it is not admissible to defame the memory of great American leaders of the past, especially when the current opposition is slinging around comparisons with Auschwitz, Pearl Harbor, and 9/11. It will all get ghastlier and more tasteless before it ends, but the nasty circus will end next year.